They've been given the task of going undercover to protect the good people of Griffin Rock and learn the values of teamwork and the power of friendship by partnering up with the town's first family of emergency responders: Fire Chief Charlie Burns, daring helicopter pilot Dani, hot-shot firefighter Kade, brainy engineer Graham and the heart of the team, Cody! Get Ready to Get Energized! Meet the TRANSFORMERS RESCUE BOTS -- CHASE THE POLICE-BOT, HEATWAVE THE FIRE-BOT, BLADES THE COPTER-BOT and BOULDER THE CONSTRUCTION-BOT characters! They've been given the task of going undercover to protect the good people of Griffin Rock and learn the values of teamwork and the power of friendship by partnering up with the town's first family of emergency responders: Fire Chief Charlie Burns, daring helicopter pilot Dani, hot-shot firefighter Kade, brainy engineer Graham and the heart of the team, Cody! 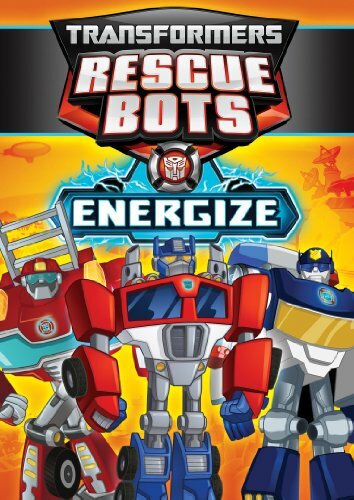 On June 11, 2013, learn what it really takes to be a hero with the release of Transformers Rescue Bots: Energize on DVD from Shout! Factory Kids and Hasbro Studios. Featuring five exciting, hilarious and fun-filled episodes, this DVD is priced to own with a suggested retail price of $14.93. Executive produced by Jeff Kline (TRANSFORMERS PRIME), TRANSFORMERS RESCUE BOTS features the vocal talents of LeVar Burton (Star Trek: The Next Generation), Lacey Chabert (Party of Five), Steve Blum (TRANSFORMERS PRIME), Maurice LaMarche (Emmy(R) Award winner for Futurama) and the legendary Peter Cullen who voices OPTIMUS PRIME when he makes cameo appearances in the series. The TRANSFORMERS RESCUE BOTS series is currently airing on The HUB TV Network in the U.S. and on Treehouse in Canada. Hasbro Studios is the Los Angeles-based production division of Hasbro, Inc. (NASDAQ: HAS). The studio develops and produces shows based on Hasbro's world class brands, including TRANSFORMERS, MY LITTLE PONY, LITTLEST PET SHOP and SCRABBLE. Many of these shows air on The Hub, a television network for kids and their families. Studio programming can also be seen in more than 170 countries globally. The Hub is a joint venture between Hasbro and Discovery Communications (NASDAQ: DISCA, DISCB, DISCK).